It was a pretty uneventful week. It seems lately that, though I have quite a list of things I want to do, I feel stalled out. Here at the house, I wander from one project to another, putting things down and moving on before I really even get started. It's frustrating. Getting out of the house is the best medicine. It doesn't help at all with getting me drawn into my projects, but it does get me doing something. I'm enjoying being out on these brisk winter days. 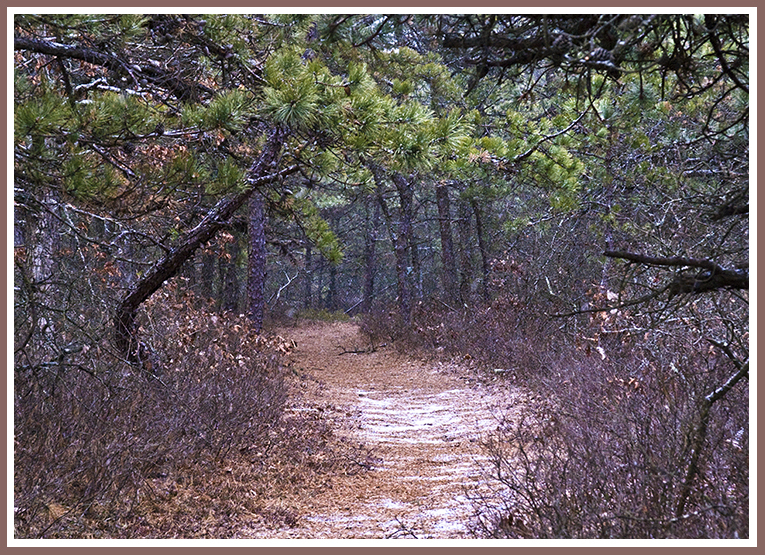 On Friday, my friend and I went to explore the Quogue Wildlife Refuge. It had been recommended by a Long Island birding enthusiasts site as a good place to see a nice variety of winter waterfowl. We weren't particularly blessed in that regard that day but we discovered their beautiful hiking trails. It was supposed to be in the mid 40's on Friday, but it started out below freezing. 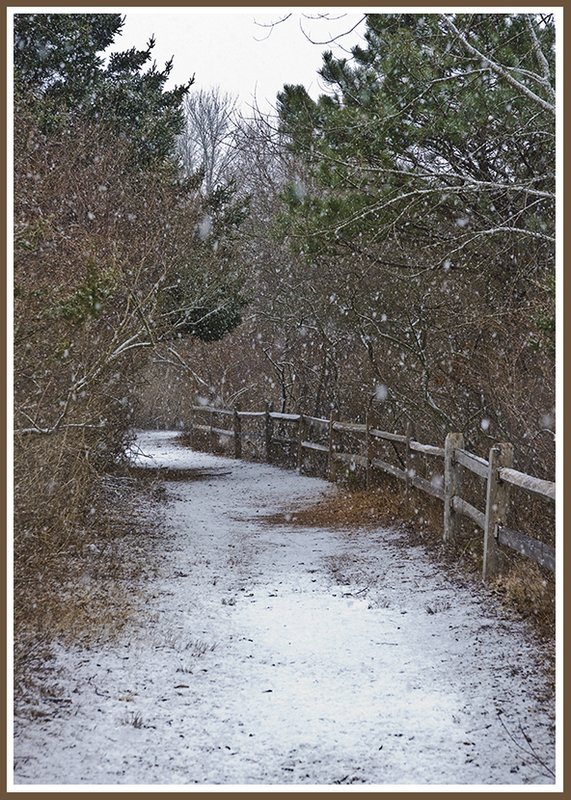 While we were walking the trail, the most beautiful snow began to fall. It was big fluffy flakes that would stick to my checks and lashes. Walking the trail was like walking in a fairy tale. I was positively jubilant. I just LOVE winter. I am a little tired of our cold dry winter here in ABQ, while the rest of the state gets wonderful snows we stay grey and dry - but I love the kind of winter you show in these two photos. I can just feel the snowflakes in my hair, on my face. Georgetown, DE, will get a heap of snow today - I feel more homesick than ever. But today the sun is shining, and I'm getting out for a walk ASAP. The bird photos on your photo blog are stunning - what faces, what wisdom in those fierce feathered visages. I have too much to do around the house. I was just lamenting that I wished I had the funds to pay someone but sadly even if I did I wouldn't. I like to get out to avoid doing them but I also don't go out sometimes with the excuse to myself that I need to get "x" done. Yet, like this morning, I accomplish nothing. Errrrggg But, I suppose if that's the worst of my problems, life is grand. The trails and your pictures of them look wonderful. It even makes me want to explore and I don't like being cold. So nice to hear you're happy and if it takes geting out.. git out MORE! It's also rare to hear anyone love winter as you do! But that's one of the things I love about you...how you find joy in so very many things that others may not. Sounds like a wonderful place to walk and refuel. If I could enjoy big fluffy snow flakes every day I would have to say I would love winter too. The frigid temps that keep snow at bay are not my favorite. I am grateful to have located you. You used to read my "Hey Let's Talk" and other journals, that no longer exist. I so wish I'd been on that walk with you. I don't love the coldness of winter but treaure its unique beauty. Have an awesome day, Kat. So glad you are getting out and about. The photos are gorgeous. I especially like the second. It looks so peaceful. What a beautiful trail for walking and photographs. Maybe I need to get out of the house with my camera to feel better? I've been going from one box to another trying to find my sanity. I thought I packed it.